After the assassination of Archduke Franz Ferdinand on June 28, 1914, the world was plunged into war. Germany, realizing they were likely to face a two-front war, attempted to defeat the western foes before the Russians were able to mobilize their forces in the East (estimated to take six weeks), using the Schlieffen Plan. On Christmas Eve, many German soldiers put up their Christmas trees, decorated with candles, on the parapets of their trenches. Hundreds of Christmas trees lighted the German trenches. The British soldiers could see the lights but it took them a few minutes to figure out what they were from. British lookouts reported the anomalies to their superiors. Could this be a trick? British soldiers were ordered not to fire but to watch them closely. Instead of trickery, the British soldiers heard many of the Germans celebrating. In other areas, the two sides exchange Christmas carols. This fraternization on Christmas Eve and again on Christmas was in no way officially sanctified nor organized. Yet, in numerous separate instances down the front line, German soldiers began yelling over to their enemy, "Tommy, you come over and see us! "8 Still cautious, the British soldiers would rally back, "No, you come here!" · We shook hands, wished each other a Merry Christmas, and were soon conversing as if we had known each other for years. We were in front of their wire entanglements and surrounded by Germans – Fritz and I in the centre talking, and Fritz occasionally translating to his friends what I was saying. We stood inside the circle like streetcorner orators. 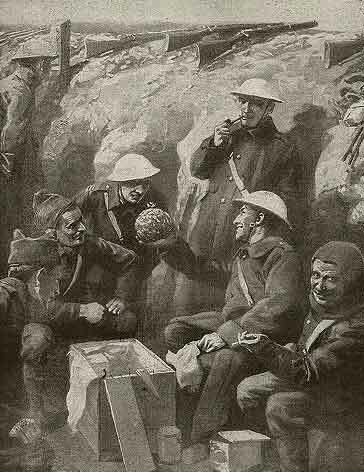 One of the main reasons Christmas truces were negotiated was in order to bury the dead. Though some had died recently, there were corpses out in No Man's Land that had been there for several months. Along with the revelry that celebrated Christmas was the sad and somber job of burying their fallen comrades. On Christmas day, British and German soldiers appeared on No Man's Land and sorted through the bodies. In just a few rare instances, joint services were held for both the British and German dead. 1. Lieutenant Sir Edward Hulse as quoted in Malcolm Brown and Shirley Seaton, Christmas Truce (New York: Hippocrene Books, 1984) 19. 2. Leslie Walkinton as quoted in Brown, Christmas Truce 23. 3. Andrew Todd as quoted in Brown, Christmas Truce 32. 4. 6th Division of the Gordon Highlanders Official History as quoted in Brown, Christmas Truce 34. 5. II Corp's Document G.507 as quoted in Brown, Christmas Truce 40. 6. Lieutenant Kennedy as quoted in Brown, Christmas Truce 62. 7. Jay Winter and Blaine Baggett, The Great War: And the Shaping of the 20th Century (New York: Penguin Books, 1996) 97. 8. Brown, Christmas Truce 68. 9. Corporal John Ferguson as quoted in Brown, Christmas Truce 71. 10. Oswald Tilley as quoted in Brown, Christmas Truce 97-98. Brown, Malcolm and Shirley Seaton. 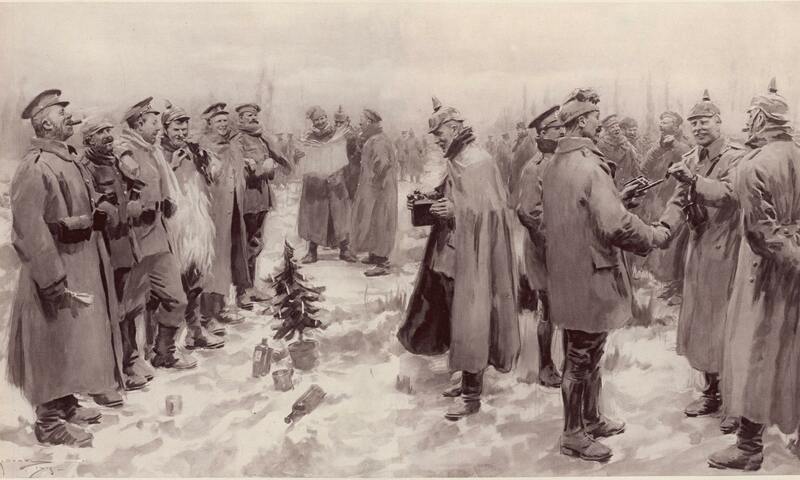 Christmas Truce. New York: Hippocrene Books, 1984. Terraine, John. "Christmas 1914, and After." History Today December 1979: 781-789. Winter, D. "Time off From Conflict: Christmas 1914." The Royal United Service Institution Journal December 1970: 42-43. Winter, Jay and Blaine Baggett. The Great War: And the Shaping of the 20th Century. New York: Penguin Books, 1996.